How can a painting shed light on the relationship between the environment and the economy? Fitz Henry Lane lived at a time of growing prosperity for Gloucester and greater Cape Ann. Industries like haying and lumbering were common occupations up and down the coast, but not all communities had access to the dangerous yet lucrative fishing and granite industries. This lesson explores the natural resources in the area and the various Cape Ann industries as depicted in Fitz Henry Lane’s artwork. Students will identify natural resources in paintings of Gloucester, Massachusetts. Students will work together to analyze how Gloucester’s environment influenced its economy by taking a close look at paintings and supporting resources. Students will orally report their findings to the class. Begin by posing the essential questions: What are natural resources? How do people use natural resources in their businesses? What examples of natural resources can be seen in paintings that tell us what goods and services local businesses and industries provided for the citizens of Gloucester? How did Gloucester contribute to the industrial growth of America in the nineteenth century? What evidence can we find to support our answer? Explain to students that they will be thinking about these questions as they look at paintings created by Fitz Henry Lane in the nineteenth century. When done, they will be asked to answer the last two questions in front of the class. Put students into four groups. Make sure each group has their own device for viewing Fitz Henry Lane Online. Assign each group one of the following paintings: /entry:29/, /entry:38/, /entry:45/, /entry:10/. 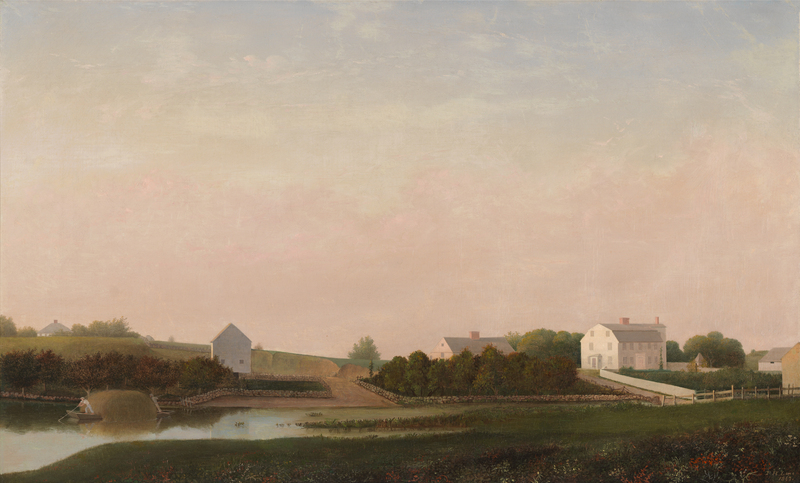 Each painting sheds light on various aspects of Gloucester’s economy in antebellum America. As the students closely examine the primary and secondary sources they will learn more about fishing, quarrying, marsh haying, tourism and trade. Students should keep in mind the essential questions while filling in their charts. Show students how to access Fitz Henry Lane Online with the class. Pull up Babson and Ellery Houses, Gloucester, 1863 inv. 10. Have students look closely at the image. Show them how to navigate their way around the painting and how to access the interactive feature as well as historical materials. Have each group fill out the chart for their painting as they share what they see, think, and wonder about. Have them work together to fill in the “I know” section. Once the chart is completed, students should use the information to answer the question: How did Gloucester contribute to the industrial growth of America in the nineteenth century? Students should cite specific evidence to support their answers. Each group will stand in front of the class and report their findings, answering the question: How did Gloucester contribute to the industrial growth of America in the nineteenth century? Students should use Fitz Henry Lane Online to cite specific evidence to support their answers. Students can use their findings as a foundation to determine the status of that industry in Gloucester’s economy today or in the greater global economy. Students will understand the theme of people, places and environments involves the study of location, place, and the interactions of people with their surroundings. Students will understand the physical characteristics of the region and the interactions of people in these places with the environment. 4. Distinguish between primary and secondary sources and describe how each kind of source is used in interpreting history. 8. Define and apply economic concepts learned in prekindergarten through grade 6: producers, consumers, goods, services, buyers, sellers, natural resources, taxes, specialization, savings, entrepreneur, prices, markets, scarcity, trade, barter, money, medium of exchange, supply and demand. Integrate visual information (e.g. in charts, graphs, photograhs, videos, or maps) with other information in print and digital texts. Analyze the main ideas and supporting details presented in diverse media and formats(e.g., visually, quanitatively, orally) and explain how ideas clarify a topic, text, or issue under study. Citation: "Farms and Fish: A Closer Look at Cape Ann's Industries." Fitz Henry Lane Online. Cape Ann Museum. http://fitzhenrylaneonline.org/resources/for_teachers.php?name=Lesson%20plan%202B:%20Grades%206-8 (accessed April 22, 2019).